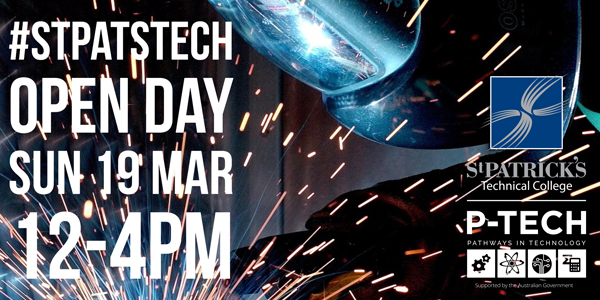 Come and discover why joining St Patrick’s Technical College in Year 11 is the best option to give you the head start you want in a trades and technical career! You can join StPatsTech in Y11, 2018 and study specialist trade theory subjects alongside a Certificate II technical qualification. By the end of Y12 you can be part way through the first year of an apprenticeship at the same time as completing your SACE. Through our large industry network we can connect you with employment opportunites in all these areas across northern Adelaide, the metroplitan area and the rest of South Australia. In the past 10 years, over 760 students have started their careers through apprenticeships at St Patrick’s Technical College while finishing Y12. That’s two out of every three students who have joined us! If you’re in Y10 and looking to give yourself the best chance to get a head start on the career you want, Open Day is a great time to lodge your enrolment papers for 2018. Getting in early ensures you are allocated a place in your first preference course. This entry was posted in Latest News on 18/01/2017 by St Patrick's Technical College.